Taking a few moments to measure your horse will help you select a blanket that fits and performs the best. Find a soft measuring tape or long piece of string. Place one end of the tape in the middle of the horse’s chest. Pull the tape around his shoulder, across his barrel, and around his hip to the point of buttock/edge of his tail. 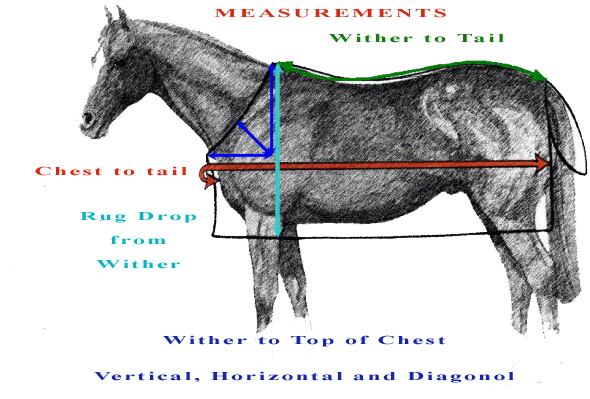 Make sure the tape stays horizontal to the ground and goes around the widest part of your horse. Determine the number on your tape (in inches) when you reach the tail. If your measurement is an odd number, round up to the next even number: this is your blanket size! How to Measure Your Horse & Find the Proper Blanket Size for a Correct Fit Fitting A Horse Blanket. When trying a new blanket for size, we recommend placing a thin, clean stable sheet on your horse first to keep the new blanket as clean as possible. Place the blanket on your horse and fasten all front closures. Gently slide the blanket back so it rests comfortably at the shoulder and chest. Fasten the surcingles or belly band and make adjustments to secure it in place. Surcingles should fit loosely on the horse's stomach with approximately four fingers width between belly and straps. Whether you choose to cross the leg straps or not, be sure they are adjusted properly. Leg straps should be snug enough so that they do not leave enough room for a horse to hook a shoe or foot during play or while rolling; yet not too snug that the straps rub or irritate the horse. Properly fitting a pony or horse blanket is extremely important to prevent shoulder & wither rubs as well as any injuries that could possibly result from an ill-fitting blanket. To check the length, stand behind the horse and gently bring the two ends toward one another against the horse's rump... be cautious not to pull the blanket out of place as you do this. If the ends meet on the horse's tail, then the blanket is too large. If you cannot bring them together at all or if you can see more than 2-3 inches of the horse's rump on either side of the tail, then the blanket is too small. To check the blanket fit on the front of your horse, it is best to watch the horse walk. As he moves forward, observe the shoulders. If the blanket fabric pulls tightly against the shoulder to the point of possibly impeding the freedom of movement, then it is too snug. If the blanket drops very low at the shoulder or chest, then the neck opening and/or blanket is too large. When checking the drop of the blanket, please note that most turnout blankets will have a longer drop to ensure ample coverage and protection from the elements. The blanket drop should be proportionate to the length and overall fit. In general, the drop should cover the belly, but should not go more than halfway to the horse's knees and hocks. American" cut horse clothing is primarily used in the design of stable sheets, stable blankets, dress sheets and custom horse clothing. Providing a more contoured fit compared to the European cut, the American cut provides a center seam and rump darts to ensure a more 'fitted' appearance. Neck opening style and size varies between manufacturers and designs on how low or high they are cut. Some cuts offer a more generous opening to provide more freedom of movement for broad shoulders. Thoroughbred cuts generally offer a more narrow design through the shoulder, but with a cutback neck for higher withers. American-cut horse clothing is sized in 2" increments. Sizing The "European" cut is the most common style in turnout blanket designs. They generally do not have a center seam; therefore, they do not follow the contour of the horse's back. The neck line may be slightly higher than American-cut horse clothing, generally making the opening of the neck more narrow. In addition, darts are not used and therefore, blankets are not generally 'fitted' to the horse's rump. Overall, this design provides a "drape" like effect for a more generous fit. This often allows for better coverage and protection against Nature's elements. Most European cut blankets and sheets are sized in 3" increments. Turnout blanket manufacturers like Weatherbeeta & Horseware Ireland favor the European cut.